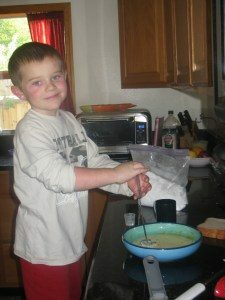 My Kids Have Food Allergies – Who Knew?!? Hi! I have been MIA lately but I promise there is a good reason. Recently, I have been consumed with researching certain topics that pertain to my kids. I have a lot of research left to do that I assume this will never end. It turns out that my kids have food allergies – who knew?!? 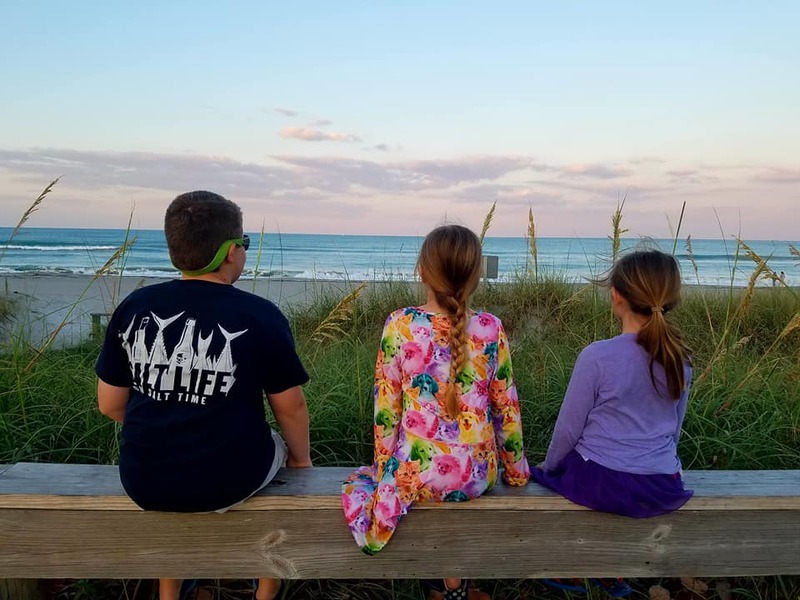 Discovering that my kids have food allergies was such a surprise.I am so grateful that we found out about their allergies before something potentially bad happened. Time for me to exhale. 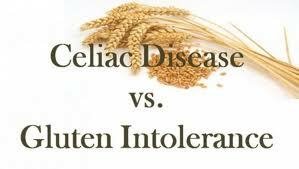 Gluten Sensitivity or Celiac Disease? This craziness all began when Shane and I decided that it would be beneficial to know if Audrey is gluten-sensitive or has celiac disease. She stopped eating gluten several years ago when we were eliminating foods in an attempt to find out what was bothering her. She hadn’t gained weight in a year, her hair didn’t grow, constant stomach aches, horrible (I mean horrible!) gas, and frequent hives and fevers. When we eliminated gluten she gained weight almost immediately and ALL of the negative symptoms disappeared. We didn’t have her tested for celiac prior to going gluten-free. DO NOT do this! If you suspect celiac get tested prior to going gluten-free. Fast forward to a few months ago. We scheduled an appointment with a GI doctor and she began a gluten-challenge. It was all fun and games in the beginning, she had a bucket list of foods she wanted to eat – fried rice, donuts, triscuits, and so much more! A few weeks into the challenge and she was ready to throw in the towel. Gluten was obviously affecting her body negatively. We lightened her gluten load a bit but kept moving forward. Audrey also had a genetic test performed. I thought that I knew a lot about celiac, obviously I didn’t because I had no clue it was genetic. We found out that she has one of the two celiac genes. Wow! The fact that Audrey had one of the two celiac genes led us to get Alex and Ava tested. I decided if they were having to have blood drawn they might as well have allergy testing performed as well (thank goodness for that!). Alex went first, he was actually excited about it….until he sat in the chair to have his blood drawn. I recall him saying, “What did I get myself into?? ?” as she came in the perform the test. He was a trooper and requested that we not do school that day. Deal. Audrey was still eating gluten at this point. She was tired, constipated (which was surprising), EXTREMELY cranky, had several bouts of hives, and her geographic tongue and yucky gas returned. We were still moving forward. Two weeks after Alex’s blood was drawn we received the results. No celiac, negative for both of the celiac genes, positive for dust and shellfish. I was so surprised that he tested positive for a food allergy. Then I got to thinking. The last two times he ate shellfish he felt crummy and vomited. The most recent time he ate it he also said his mouth felt funny. I blamed it on the restaurant. Bad mama. Years ago he had his first allergic reaction to penicillin. It started with vomiting then it got much worse. The photo to the right is Alex recovering from this allergic reaction. He was covered in hives and his joints were so swollen he had to mix the eggs with two hands. I am so glad we found out about his shellfish allergy before we were in a bad situation. He now has an EpiPen. I never thought we would be owners of an EpiPen. Audrey made it through her 8 week gluten challenge and was ready to be done. She had a few last requests, pizza and a donut, but was overall ready to return to her gluten-free life. She has been eating gluten-free for years so this was easy for both of us. 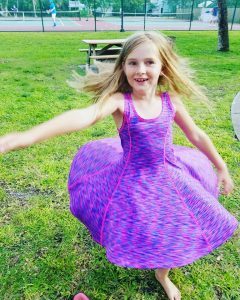 Her final blood work results were positive for celiac. Her GI doctor wanted to follow with an endoscopy to see the extent of damage in her intestines. We declined. Audrey is 7 and the thought of exposing her to anesthesia was just too much. 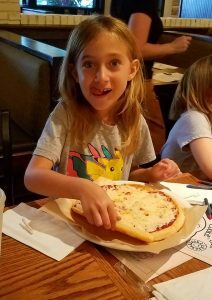 Knowing the way in which her body reacts to gluten, her positive celiac gene, as well as her high celiac blood results was enough for us. Audrey resumed her gluten-free diet and is once again thriving and feeling great! She is back to gaining weight, (she lost weight during the challenge), her tummy feels so much better, no more hives or itchy hands and feet, and her mood is SO much better. I somewhat regretted having her go through the challenge but realize that it was for the best for our family. If it wasn’t for her situation we wouldn’t have had Alex and Ava tested. It also solidified that Audrey has celiac disease. Ava was the last and the most nervous to have her blood drawn. She was super brave and had the same request as Alex – no school. Done. I got the call this week. “She does not have either of the celiac genes but I need to talk to you about her other results”…I was happy about the no celiac but nervous for what news I was about to receive. Ava’s total IGE was 1,389. 300 is high so this was a very high number. Her body is in serious fight mode against an allergen or allergens. Her high positive results were cats, dogs, and milk. Her moderate results were dust mites, mouse urine, and cockroaches (yuck! ), and her super low results were shrimp and wheat. Again, bad mama moment. I blamed several of her what I think were dairy allergy symptoms on her asthma. She would cough while eating ice cream and typically need to use her inhaler, a lot of sneezing and itchy eyes after mac and cheese. Hindsight, man it’s rough. Our goal right now is to get sweet Ava’s body out of fight mode. She is going dairy free and I ordered several additional air purifiers for our home as we have pets. I also intend to follow-up with an allergist. Gluten-free is easy for me now. I realize that it wasn’t always this way. I assume that in a few months that is how dairy-free will be for me. I am excited because this will bring us back to basics, which is where I like to be. I am excited to make dairy free cheese, sour cream, and so many more staples. Please (pretty please) use my Amazon link to the right so I can save for a Vitamix. In all honesty, I know that this will be a healthy change for us all! Food is easy to address, feelings and emotions are more difficult to navigate. The emotional aspect of having food allergies is big. Audrey has settled into gluten-free well, she has years under her belt. Alex is scared of having an allergic reaction. He makes sure his EpiPen is with us at all times. I try to assure him that he is going to be okay but his need to be prepared is strong. I can’t fault him for that. Ava is pretty sad and mad about her allergy. It is very new to her. I know that she will feel better and this will help her to see that this is all for the best. We had fun searching dairy free recipes today and she ended the day feeling excited for new things. I am sure that I will share more about our food allergy journey in posts to come. 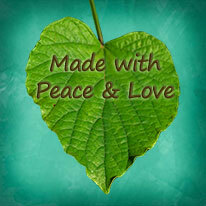 AND stay tuned for lots of super yummy dairy free recipes! To see a list of my yummy recipes please click here. Thank you Kendra! I am lucky to have friends like you. Thank you for offering me so much support and guidance through all of this – it means so much to me!! I hate the results of all these test! :(, but at the same time I am so glad you are here Mother! You will get this down in no time!! And Amazon will get all my purchases through your site!! We will get this down, no worries! Thank you for your love and support, it means the world to me. Honestly, I think we will all feel much better eliminating gluten & diary! Thank you for using the link! I don’t have food allergies but have been moving further and further towards veganism. I’d LOVE a non-dairy sour cream recipe that really tastes like sour cream so I’m excited to hear what you come up with! Hopefully the kiddos settle into their new routines easily! I have been wanting to go dairy free for quite some time and this just puts a bit more pressure on me! Ava is already feeling better, after only a week without dairy – makes me very happy. Kids allergies are tough especially because they aren’t always able to tell you what’s really wrong., My son is allergic to shellfish and his lips puff up quite a bit when he eats shrimps or crabs. it’s a real bummer because he loves seafood. I’m sorry about your son! It is sad, especially when they know they love it. My son’s favorite activity is fishing, he was nervous that he wouldn’t be able to use shrimp as bait when he first found out. It hasn’t been a problem, he just makes sure to wash his hands.